Why Doesn’t LotRO Hold My Attention? I love Lord of the Rings Online. Video game adaptations of existing IPs tend to be almost universally awful, but LotRO is one of the shining examples of how to do this right. The characters feel Tolkienic, no shortcuts are taken on the story, and there are tons of little details straight out of the books (for instance, I just noticed that Farmer Maggot’s three hounds, mentioned briefly in Fellowship, can be seen running around his farm, with nameplates and everything). Not only is it well adapted, the gameplay is great as well. They have some surprisingly unique and interesting classes, and there’s a nice variety of PvE content for any group size (even if that’s a group of one). So why is it that I never stick around LotRO for very long? 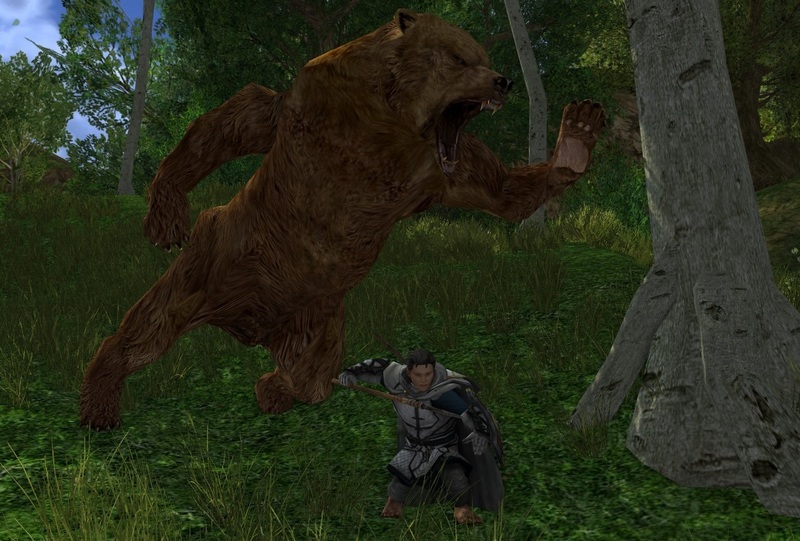 I recently popped into LotRO just to take a few screenshots of my warden fighting a bear so I could post this joke on Twitter referencing ESO’s new warden class. I’ve always felt like LotRO’s warden was a cool class, but was too complex for my casual playstyle, and never ended up playing him past the Archet tutorial area. But, in the time that it took me to run around the Shire looking for a bear to take a selfie with, the class really grew on me, and I got him to level 20 in just a few short play sessions (hobbit joke not intended). I really want to get through “the long dark of Moria” with my rune-keeper, though, because this always happens; I always find a new class that I want to play just as I’m getting to content I’ve never done before. I’m starting to get annoyed with myself for having owned all of these expansions for so long and never actually experiencing them. Let’s face it, while LotRO seems to be having a nice resurgence lately under its new management, it won’t be around forever, so I’d like to see as much of it as I can. Dangit, LotRO, your classes are all just too darn fun. Another problem is that LotRO is very clearly an older MMO, with all of the barriers and annoyances that comes with that. Getting around the world isn’t very convenient or fast, and that takes away a lot of momentum (remember, games designed for a subscription model want to waste your time as much as possible so you stay subbed longer). Also, I think I’m spoiled by games like Guild Wars 2 where leveling is fairly quick, because I feel like I’ve been the same level for ages. I can’t imagine what it must be like when your levels start getting into the hundreds. Maybe that’s kind of a silly reason to get burnt out on a game, but there’s something about seeing that bar at the bottom of my screen fill up that keeps me motivated. Also intimidating is that there are a lot of systems that I don’t quite know what to do with yet. What’s the best thing to do with the truckload of Legendary Items I don’t want? The bonuses on the LIs I currently have aren’t that great, so should I keep trying to get new ones, or should I not worry about it much until I get to a higher level? I should probably join a guild and ask for advice with these kinds of questions, but I have this (probably irrational) feeling that players are probably super tired of answering dumb questions about systems that are nearly ten years old at this point. I’ve been alternating between my mid-50s rune-keeper and my low-20s warden the last few nights, and I’ve been having a lot of fun with it. I’d like to say that I’ll be sticking around for a while this time, but every time I say that I end up realizing shortly thereafter that I haven’t played it for a week or two. We shall see! I’m the same. Classes seem pretty interesting out of the gate, the world looks nice… and I think I’ve got a level 13 Minstrel as my highest character…. I just never stay long. It just doesn’t “stick” for me. Have you discovered Lotro-wiki? It’ll answer a lot of questions, though more for the purely factual info than stuff that might be a matter of opinion. As for LIs you don’t have to worry about getting them just so in order to be able to do the content. You might want to try to tweak them is to suit how you like to play though. e.g. Do you want to bump up your DPS or have better self-heals? Enjoy using crowd-control, or never even bother with it? Like to kite, or hate it? By choosing legacies you can make different ways of playing work. I do look things up on lotro-wiki from time to time, but, like you said, a lot of my questions are kind of subjective. I guess I should probably read more and form my own opinions, though. Good to hear that mediocre LIs aren’t too big of a disadvantage. I guess my biggest problem is that I usually end up with one or two legacies I want and the rest aren’t really useful to me. I guess I’ll just keep dumping points into the ones that seem useful and ignore the rest. Do you know that when you deconstruct an LI after it’s got to level 31 or higher you get a bunch of stuff, including a choice of one of the legacies to take away as a scroll that you can then apply to another LI? Using this process you can put together a collection of the legacies you like on one LI. You should have six slots for LIs, so you can level up a bunch at the same time, and use the things you get to put together a personalized one. It’s not needed to do such things to play the game successfully, but it can help you play it your way. When leveling I don’t bother that much with LIs. I usually update them every ten levels or so (which follows the power creep added with expansions of 10 new levels fairly well). I don’t use high tier relics, since you lose them when you deconstruct your old weapon. Some of the tier 1 and 2 relics are fine for just leveling. Note that you want to spend all points in the DPS stat of your main hand first: that makes for the largest increase in damage output, even if you do get useful legacies. Same goes for tactical healing rating for offhands of some classes – the top thing you can spend points in always goes first, generally speaking. You want to max out the DPS on your main hand weapon…. if you are a melee DPS class! Some classes only do a small portion of their damage with their melee weapon, so for example if you’re a hunter you are better off spending the points first where it will add to your bow damage rather than upping the melee weapon DPS itself. Similarly on my Guardian I wasn’t about maxing out the DPS so much as getting a balance between good survivability and decent damage.